If you think of Heroku add-ons in general as of boxes with some useful mechanisms inside (like databases, log analyzers, messengers etc. ), then Dockhero is an empty box where you can put your own mechanism described by docker-compose.yml. When you add Dockhero add-on to your Heroku application, a new Docker cluster (currently consisting of a single Swarm master) is provisioned, and it&apos;s address is exposed to your Heroku app via DOCKHERO_HOST environment variable. The dh:compose shortcut assumes that your stack is named dockhero-compose.yml. It also makes your Heroku environment variables available via variables substitution, so that you don&apos;t have to commit your secrets into Git. 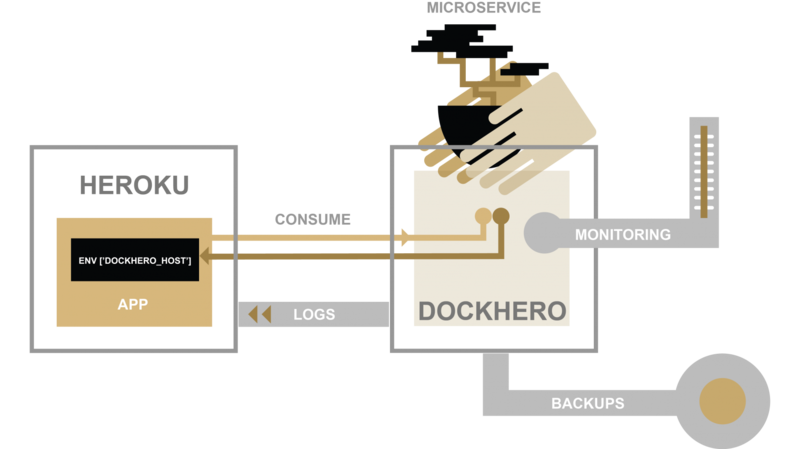 The logs are streamed into Heroku logs. If for some reason you want to run apache or nginx as a microservice, you&apos;ll find access.log and error.log entries among your Heroku logs. Heroku environment variables are available in dockhero-compose.yml. This way you store the configuration of your microservice "the Heroku way" and don&apos;t commit your secrets into git. Monitoring and Alerts. You&apos;ll be notified if your app consumes more than 90% of available memory or disk space. You can enable Newrelic integration to get detailed resource usage history. EBS volumes with daily backups. We created a volume driver which mounts your Docker volumes to Amazon&apos;s EBS.